Turkmenistan Airlines, which also flies to Birmingham, has been added to the European air safety risk register. One of the leading budget routes between the UK and India has come to an abrupt end after the European Aviation Safety Agency (EASA) placed Turkmenistan Airlines on a blacklist. The airline from the former Soviet republic of Turkmenistan flies from Heathrow and Birmingham to Delhi and Amritsar via Ashgabat. It has been banned from flying to or from the EU, according to a Foreign Office notice put out overnight for travellers to India. While the risk register itself has not been updated, the Foreign Office warning says that Turkmenistan Airlines flights have been suspended «pending confirmation that it meets international air safety standards». A Turkmenistan Airlines flight due in to Birmingham at 5.40pm on Monday has been cancelled, along with all subsequent operations until the ban is lifted or the UK ceases to be governed by EASA decisions. The carrier had five flights a week from Birmingham to Ashgabat and a weekly departure from Heathrow. Almost every passenger on its flights from Britain connects to services to India. The Independent estimates that up to 5,000 British passengers are in India with bookings to fly home on the airline. Turkmenistan Airlines operates a motley fleet of aircraft, including one Boeing 757 which is 27 years old. According to the carrier’s timetable, this is the aircraft type used for UK flights. 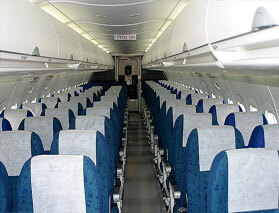 The airline, which was set up in 1992 after the collapse of the USSR, has never suffered a fatal accident. Its hub is only 15 miles from the Iranian border. Turkmenistan Airlines has long provided a connection for Britain’s Sikh community to Amritsar, location for the Golden Temple, and the Indian capital. Flights linking Ashgabat with Frankfurt and Paris have also been grounded.